Has God made a way for us to be delivered from the slavery of the kingdom of darkness to become heirs of the kingdom of light? The answer is yes, He has. The way that God has made for us is through the death of Jesus Christ on our behalf. On the cross, Jesus took upon Himself the curses due to us by our disobedience so that, in turn, we might enter into the blessings Jesus earned by His obedience. These blessings cover the whole area of the kingdom of light. Both the curses and the blessings are worked out in three main areas of our lives: spiritual, physical and material. What are the spiritual curses from which Christ has delivered us? Likewise, what are the spiritual blessings which Christ has made available to us? First of all, let’s look at the basic causes that bring blessings as well as the causes that bring curses. Next, Moses turns to the reason why the curses come. Our whole destiny for well-being or for disaster is settled by the voice of the Lord. Listening to the voice of the Lord and obeying what He says will bring blessing. But not listening to the voice of the Lord will bring curses. Of course, it is not sufficient to listen to the voice of the Lord unless we also obey what He says. Conversely, it’s impossible to obey what God says unless we first hear His voice, because His voice tells us what He wants us to do. The Amplified version says, “But I have this one charge to make against you: that you have abandoned the love that you had at first. You have deserted Me, your first love. This requirement is stated clearly by the Lord Himself in Jeremiah 7:22–23. In these verses, God explains what He really required of Israel. You may think that the New Testament is different, and I hope that’s not the case because it isn’t true. The principle is exactly the same. Jesus sums it up in one single verse, in John 10:27: “My sheep hear My voice, and I know them, and they follow Me” (NASB). The mark that we really belong to Jesus is not that we practice certain denominational patterns of life or worship, or say all the right words in our prayer life or adhere to a specific doctrine, but that we hear His voice! And in hearing His voice, that we follow what He tells us. And why wouldn’t we? I mean really, why wouldn’t we listen and follow the God that saved us? It is established in scripture that the simple pathway to God’s blessings is to hear and obey His voice. The inevitable end of not hearing and obeying God’s voice is to receive the opposite of blessings, which is curses. What? You don’t think it’s possible to curse yourself? Let’s prove it out in scripture then. Let’s start with the curses in the spiritual realm of our personality that result from disobedience to God. These are listed quite clearly by Moses in Deuteronomy 28. · In verse 20, Moses says we will experience confusion in all we undertake. · In verse 28, smitten with madness and bewilderment of heart. · In verse 34, we shall be driven mad by what we see. · In verse 65, a trembling heart and despair of soul. These are some of the spiritual consequences we encounter in the lives of people in today’s world: confusion, frustration, inner agony and torment. Do these sound familiar to any of you? Do you know anyone who is afflicted with any of these issues? I have but one question here, do these attributes sound like they come from God? The answer is no. So then what does this mean to us? It means that if we are disobedient to the voice of the Lord that His attitude towards us changes. He still loves us, don’t get me wrong here. But if we are going to deliberately disobey His voice, His word, His commandments, then we will incur His wrath. The proof of this lies in what happened to Adam & Eve! God had given them every provision they could ever want, He gave them complete authority and dominion over the earth and everything on it. But He also gave them one rule: Don’t eat of the fruit of this one tree. You can have everything else on earth, but if you eat the fruit of this one tree you will be cursed! We all know how that turned out, not so good, not just for Adam & Eve but for all of humanity! God didn’t just curse His beloved creation, His glory, but He curse the seed of their seed! We are all of us living under that same curse – but God has given us a way out, through His son Jesus Christ. But even then, even when we accept Jesus as our Savior there are still rules to follow – and the number one rule is that we listen to and obey His voice. It’s the garden of Eden all over again folks. Our God is a God of order and governance and if we deliberately disobey His voice He will, like any decent parent, smack us. He demands our undivided attention. And when we give it to Him we are blessed beyond anything that we can comprehend. And when we don’t we incur the appropriate punishment – His Holy smack-down. So then, we’ve talked about just a sampling of the curses that we incur by not listening and obeying the voice of God. What are the blessings in the spiritual realm that result from obedience? There are countless blessings! Too numerous and incredibly wonderful to comprehend, but I believe they can be summed up in one word: peace. In Hebrew, the word is Shalom. The Hebrew word peace is Shalom. But it means so much more than just the absence of conflict. It means wholeness or well-being. It is a complete peace. It is a feeling of contentment, completeness, wholeness, well being and harmony. According to Strong's Concordance Shalom (7965 ) means completeness, wholeness, health, peace, welfare, safety, soundness, tranquility, prosperity, perfectness, fullness, rest, harmony, the absence of agitation or discord. Shalom comes from the root verb shalom meaning ‘to be complete’, perfect and full. In modern Hebrew the related word Shelem means ‘to pay for’ and Shulam means ‘to be fully paid’. Jesus endured the judgment and the punishment due to our sin and disobedience that we might be reconciled to God. As a result of being reconciled with God, we can be delivered from those four spiritual consequences we encounter as a result of our disobedience: inner agony, torment, confusion and frustration. Jesus died so that we would be complete. He paid the price in full that we might have Shalom in every aspect of our lives - Health, safety, prosperity and fullness in Him! This type of peace begins in the inner man, but it leads to total well-being. It affects every area of our lives. We can know the reality of a deep, settled, inward peace. Let’s look at two other Scriptures in the New Testament that speak of this Shalom. Philippians 4:7 And the peace (Shalom) of God, which surpasses all comprehension, will guard your hearts and your minds in Christ Jesus. What beautiful words. No longer are we guilty! No longer do we have to fear that we are not pleasing God! We have peace with God through His son Jesus Christ! This beautiful verse in Philippians 4 describes the exponential results within us. The peace of God will guard our hearts and minds in beyond all comprehension, through Jesus Christ! Let’s go back to Deuteronomy 28 to look at all the physical curses that result from not hearing and not obeying the voice of the Lord. They are indeed many. Now, this is important: As you read this, bear in mind that all these maladies are stated as curses that do not belong to the redeemed people of God. · Verse 21 He tells us that “The pestilence clings to you” Pestilence covers a variety of deadly diseases, the Black Plague is an example of pestilence, but it is defined as “any contagious or infectious epidemic disease”. Pestilence is also part of the arsenal of the fourth horsemen of the Apocalypse mentioned in Revelation 6:8. *Pestilence is mentioned by name at least 19 other times in scripture. · Verse 22 explains that we will be afflicted with consumption, fever and inflammation. Consumption commonly refers to pulmonary consumption (tuberculosis), which occurred often in the Middle East at the time; but in this case, from its association with fever in Leviticus 26:16 and Deuteronomy 28:22, it is more likely to be the much more common condition of wasting and emaciation from prolonged or often recurring attacks of malaria, which was very prevalent at the time, especially in Egypt. As such it is considered to be pestilence. · Verse 35 talks about boils from the sole of your foot to the crown of your head. Many of us as Christians are enduring curses when we should be enjoying blessings! Why? Probably for two main reasons: either because we don’t know that they are curses or because we don’t realize that Jesus delivered us from the curses so that we might inherit the blessings. Now, read Deuteronomy 28:59 and check to see whether you are living in the curses or the blessings. Do you suffer from Astnma? (Hands up) How about bronchitis or COPD? Arthritis? High blood pressure? Diabetes? Hypothyroidism? Epilepsy? Haemophilia? Glaucoma? Kidney disease? Coronary artery disease? Bipolar or Schizophrenia? There are far too many Christians suffering from sicknesses and diseases that scripture tells us we’ve been liberated from by listening and obeying the voice of God! I want you to notice when you read Deuteronomy 28 that both blessings and curses are generational in nature – handed down from generation to generation, most of the time without the afflicted, or even the blessed knowing it. God has revealed to me that I am the beneficiary of a generational blessing handed down from my mother. I say my mother because my father died at 37, I never knew him. His death and the ensuing hardships experienced by my mother lead her to the Lord. And when she remarried she and my step-father were both very active in ministry for the last 50 years of their lives together. So, since my step-father and I didn’t share the same bloodline, my blessing comes directly from my mother. The generational blessing or curse is a blood thing. Both of my folks were mentored by Derek Prince, who also taught me in my teens. As a teenager I was surrounded by and taught by mighty men of God; Derek Prince, Mahesh Chavda, Bob Mumford and Jim Croft to name a few. They were all in my living room, in my parent’s home church, for several years. Even with all this working for me, I went off the rail in my teens. I was a musician and got my first recording contract while in my teens. I was away from the Lord for 40 years. I’m a prodigal. Since making my prodigal return, the Lord has blessed me in countless ways, but one is with a healing and deliverance ministry that I inherited, by the Spirit, from my mother. I’m currently mentored by Jim Croft who was Derek’s ministry associate from 1967 until his passing in 2003. Even though I was influenced by these people, it was my mother and that bloodline that has a direct generational influence on me and my ministry. The Results of Disobedience and Rebellion. There is nothing sound in it, Only bruises, welts and raw wounds, Not pressed out or bandaged, Nor softened with oil. This passage is a metaphorical picture of the results of disobedience of an entire nation of people. I believe that, if the United States doesn’t repent and come back to its Christian roots, that we’re headed to exactly this state of being – totally stricken by God’s wrath. When we realize that Jesus has already taken all the curses upon Himself, by becoming our substitute and paying our price, that one act negates everything mentioned here – if we acknowledge Him. These verses were not just a metaphorical picture of the condition of Israel as a result of their disobedience; they are also a literal picture of Jesus as He hung on the cross. Jesus was beaten with a Roman scourge, with its nine thongs with metal and nails attached to maximize injury. Not like the caning depicted in the movie “Son of God” but more the scourging in “The Passion” movie. His flesh was literally ripped to shreds as He was being beaten. I have done research on the subject of scourging and the stats say that less than 50% of those scourged ever lived long enough to make it to the cross. They bled to death before they could get there. Jesus was not the frail weakling depicted in some movies and artwork, He was a working man, a carpenter who toiled with His hands. By the statistics alone a weakling never would have made it through the scourging, let along carry His own cross up a hill only to be nailed to it. In addition, His head was injured: the thorns had been pressed down upon His head. His whole heart was afflicted with grief for all of humanity. I truly believe Jesus died of a broken heart. This passage is an exact description of Jesus as He hung upon the cross: stricken, beaten and bleeding profusely; His head full of holes and bleeding from the rose bush thorns; His hands and feet pierced by nails and His heart totally broken for mankind. And as He hung there on the cross, bleeding out, suffocating from the weight of His own body, He forgave us. Why did He do it? To redeem us from the curse by taking on a curse for us through His obedience to God the Father. All those physical curses resulting from our disobedience against God came upon Jesus as He hung there on the cross. He took it all like a man, never crying out in pain. Can you imagine? That’s how much God loves us. This is our Savior, our Lord. Let’s look at the physical blessings that were purchased for us by Jesus. Please turn again to Isaiah 53:4-5. This is one of my favorite scriptures as it relates to physical healing, and I use it often when I minister to someone for physical healing. 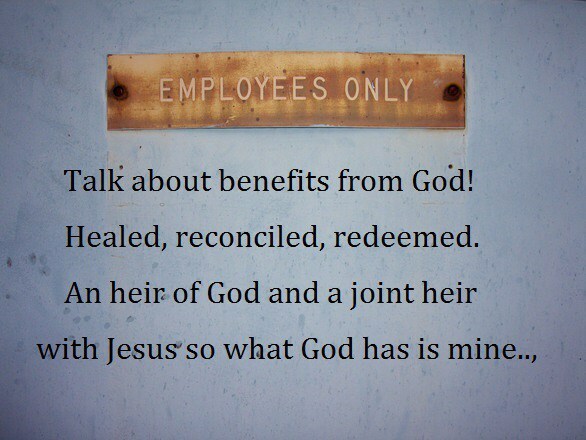 Jesus took on our physical consequences of disobedience that we might in turn have healing. We see this at the end of verse 5, “By his wounds we are healed.” Notice that the word is “healed” - past tense. Jesus has already paid the price for our physical, as well as our Spiritual sin. By his wounds healing was obtained for us. Healing was made our inheritance through the wounds that Jesus suffered on His body. His wounds became our diseases, illnesses and afflictions. Once we realize and accept this one scripture in our lives, healing becomes an instant reality. Matthew had no doubt who was referred to in Isaiah 53. He knew it was Jesus. Notice also that Matthew (a Jew who understood Hebrew), had no doubt that the application of those verses in Isaiah 53 was physical. It was the physical healing of the sick that was the fulfillment of the prophecy given in Isaiah. Jesus makes the entire man well. Every area of human being and human personality can be healed through Jesus. This what is known as an absolute truth. Again, what is the result? “Complete healing.” Jesus said, “I’ve made an entire man well.” That is the physical miracle working power of the redemption provided to us by Jesus. Now listen to this please: This does not mean that we discount doctors. We are grateful for the work of physicians and God can and has used them to work miracles. But there is only one person in the universe who can say, “I make an entire man well! 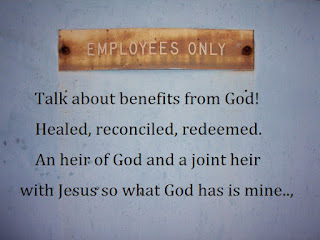 I can deal with all his problems: spiritual, mental, emotional and physical.” The Lord Jesus Christ is who heals. As we contact Jesus by faith on the basis of His redemption, the same results that took place and are recorded in the New Testament are available to you and me today through faith in Him. Just as abounding in prosperity is a blessing, so not prospering in our ways is a curse. More completely and vividly, Moses states this again in Deuteronomy 28:47–48. Here the blessing and the curse are set directly side by side. You could not have the two alternatives more clearly pictured than in those two verses. · The results of obedience: the abundance of all things, serving God with joy and a glad heart. · The results of disobedience: serving enemies in hunger, in thirst, in nakedness, and in the lack of all things. This is a description of absolute poverty; A person who is hungry, has nothing to eat; thirsty, has nothing to drink; naked, no clothes to wear; and in lack of all things. That person is in a condition of absolute poverty. It is impossible to picture greater poverty than that: hunger, thirst, nakedness, and lack of all things. The important truth we need to see is that poverty is a curse. It does not belong to the people of God! Poverty is not for the children of God! It is not for God’s redeemed people. Instead, the will of God is abundance that we may serve Him with joy and with gladness of heart. Picture Jesus on the cross. He was hungry, He was thirsty, He was naked, and He was in want of all things. Why? It had to be this way because He exhausted the poverty curse on our behalf! He completely took the curse away once and for all. Why? So that you and I, redeemed believers through the blood of Jesus, might not have to endure the curse of poverty ever again! Do you know what the word “all” in the New Testament means? In the Koine Greek, which the New Testament was written in, ‘all’ is pas, meaning ALL, the whole, every possibility. Keeping the words of God’s covenant causes us to prosper in all we do. That leaves no room for failure or frustration in any area of our lives. These are the blessings promised to obedience. Poverty is not a blessing resulting from obedience, but it is the result of disobedience. Though all of us have been disobedient, Jesus took upon Himself the iniquity of us all. Our rebellion and all its evil consequences, including poverty, were visited upon Jesus as He hung there on the cross. What’s the exchange there? Jesus took our poverty on the cross that we in turn might have access to His wealth and to His abundance. It is through grace. Grace comes only through Jesus Christ. Grace cannot be earned. Grace is appropriated only by faith. In the original Koine Greek, that statement in 2 Corinthians 9:8 is amazing. The word abound occurs twice, and the word all occurs five times! And what does all mean? ALL! This is what Jesus has obtained for us. He exhausted the poverty curse that we might inherit the blessings of His riches! That is the will of God. That is your inheritance as a believer in Jesus Christ.